In terms of entrepreneurship and innovation, Airbnb is an absolutely brilliant company. Based on the simple idea of helping peoplerent out their homes to tourists, the company’s yearly revenue has passed the $2 billion mark in its first 10 years and its services are available in almost every country on the planet. But Airbnb’s immense popularity and benefits have also come with a heap of problems. Many cities cite Airbnb as one of the major factors for increased rent, housing shortages, gentrification, and other disruptive effects of tourism. That’s why Sito Veracruz and his partners went on the ambitious quest to provide a better and fairer alternative: FairBnB. “I was quite optimistic about Airbnb in the beginning because I saw how platforms like these could spread benefits of tourism to neighbors and communities,” explained Veracruz. After years in development, the first rentals via FairBnB are set to take place in January 2019 in four cities. 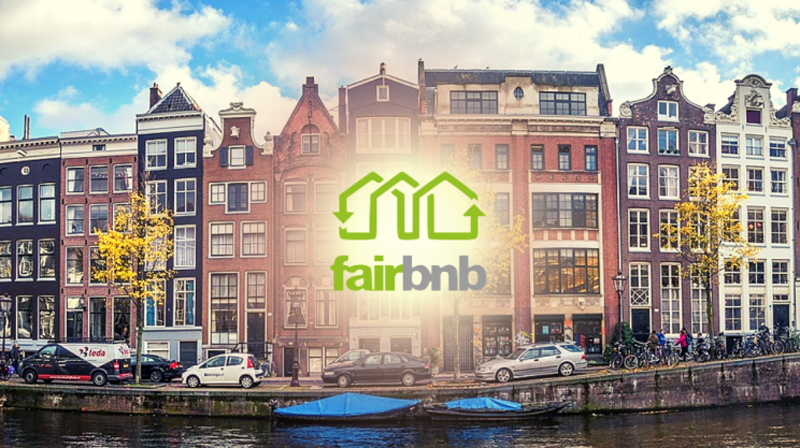 TNW sat down with Veracruz in Amsterdam, one of the pilot cities, to get a glimpse of how FairBnB plans to make vacation rental ethical and serve local communities. For Veracruz it’s obvious the Airbnb-model for vacation rental platforms is here to stay, that’s why it’s essential to provide a more beneficial alternative for local communities. According to Veracruz, FairBnB will be able to do that due to its three main difference from Airbnb. “First difference is transparency and legality. We’re not just transparent, we foster transparency and we actually want to work with governments,” says Veracruz. “That’s why we’re strict on our ‘one host, one home’ policy. We also want to pay taxes at a local level and make the whole process as transparent as possible.” Before the pilot in January, Veracruz and his team will also verify that every single host is legally allowed to rent out his or her space according to local law. “The second difference is that 50 percent of the commission will be used to fund community projects.” Prices on FairBnB should be comparable to Airbnb, but the commission will possibly be lower and its structure will be different. Only 50 percent of the commission will go to the platform’s management, while the other 50 percent will go into funding local community projects. “Our aim is to make a bigger ‘umbrella’ and include different actors in the cooperative. That would include local nodes, neighbors, investors, and eventually the hosts themselves. The hosts would then be part of the cooperative and would be able to vote in the assembly and select people to represent them in the board of directors,” says Veracruz. The splitting of the commission between management of the platform and local community projects is a novel and exciting idea, but in Veracruz’ opinion this side of FairBnB has often been overemphasized. For him, FairBnB’s biggest potential benefit is bringing communities together. The focus tends to be on the donations to community projects, but it’s just a way to strengthen ties within the community. What I’d like our guests to experience and see in the future is that this is a community run project. We aim to create local nodes which will have some authority on the platform to set the criteria for rentals, limits, and which projects to fund. But the extra step — which we’ve already started on here in Amsterdam — is to gather interested locals into an organization or a cooperative to provide services to guests and hosts. The services would range from cleaning to concierge services to basically anything that has to do with tourism. Veracruz believes that by bringing all of these services together in cooperatives, it can be ensured it’s done in accordance with labor laws and that the community itself would profit from the increased tourism — which has been sorely lacking. Veracruz also adds that FairBnB won’t ban for-profit rentals, such as buy-to-let apartments, as every community’s need is different. Some cities are struggling with overpopulation while towns in rural areas might be losing inhabitants and would need tourism to boost the local economy. The FairBnB local cooperatives are meant to be tools for local communities to adjust their vacation rentals to their own specific needs, quickly and collectively — giving locals increased say in how their community develops. This approach is understandable as a lot of communities have turned against Airbnb in their cities. It’s been especially obvious in Amsterdamwhere Airbnb rentals have gone through the roof, along with the tech giant’s pivot into building a de facto hotel, and local governments trying to crack down on rentals. But legislation moves slow and isn’t always in sync with the will of certain neighborhoods, so perhaps FairBnB’s approach will able to prevent a disconnect between locals and vacation rentals. FairBnB is scheduled to launch in January 2019 and will available in four pilot cities: Amsterdam, Barcelona, Bologna, and Venice. If you’re interested in knowing more, you can check out FairBnB’s website for updates.